If we take the world and all its contents, including us, for granted then the question of where everything comes from is pointless. However, it is only when we begin to question the origin of things that the pathway of inquiry leads us to a very interesting place. Some people would say that we live in a computer-generated dream world, like The Matrix. But most people would say that everything we see and experience is real. I tend to agree with the latter, but regardless of that, the fact that there is anything at all is at least as interesting as is the dream- world versus real-world debate. The laws of nature seem secondary to the very basic question of why should there be a universe at all, let alone the laws of physics to describe it. The truth is that all fundamental physical laws of nature merely describe how nature works a certain way, not why it works, or why it's there to begin with. Scientists have determined that the universe grew out of nothing, along with time and space. All out of nothing. The Big Bang. But how can something come out of nothing? That to me is at least as interesting as anything religion says about God and the universe. The fact that we came out of nothing is at least as amazing as the existence of God, if there was such a thing. Science is discovering facts about our universe as fascinating as unicorns and fairies, except that one exists and the other doesn't (in this universe anyway). Going deeper, every thought you have is something inside of a universe that came out of nothing, since everything you're made of, your atoms, etc. did not exist at one point. You are simply the result, one of infinitely many, of what came to be known as our universe. In fact, your consciousness, which is another fascinating part of the universe among living things, is simply an extension of the matter in your body; in particular, your brain. And if consciousness is something that happens to matter organized in a certain way (in our brains) then it must also be something that is a result of the scientific laws of nature. The reasoning comes from the fact that everything in our universe, no matter how strange, must be subject to the physical laws of our universe. In my view, understanding the origin of the universe goes hand in hand with understanding where consciousness comes from. There is likely a convergence of understanding in which the origin of the universe and the origin of consciousness can be understood as some new truth is discovered sometime in the future. I can personally talk a lot more about consciousness than I can about the universe, but ironically, less is known about the nature of consciousness than about the universe. But this is because I am living and experiencing consciousness at every waking moment, but at the same time have utterly no clue on how it is created. In fact, this question has often been asked throughout history: What makes me, me and what makes you, you? Let's explore this further. As mentioned, what goes on in our brains to give us consciousness cannot be separate from nature since we are a part of nature, and however amazing consciousness is, it must be a consequence of the laws of nature interacting in a certain way, and which results from the specialized organization of matter within our brains (along with electrochemical impulses). The fact that I feel very much as an individual with thoughts separate from every other individual tells me that there is something very interesting going on with respect to consciousness. Where does it come from? Does consciousness reside within a select area of my brain or inside my entire brain in which it all works together to give me consciousness? And why does it feel so unique to me? In some ways it feels ageless, permanent, like energy which cannot be destroyed. It can only change forms. My consciousness also feels magical in some ways. Not so different from a talking rock. I am made up of matter, but so is a rock, and yet I am conscious but the rock is not (as far as I know). And going back to this "uniqueness" feeling, what is it? Surely it's a main part of consciousness, that feeling of individuality. What laws of physics can produce this feeling? And what happens to the mind after death? If we don't know where consciousness comes from how can we know for sure where it goes after death? But regardless of the speculation, it cannot be argued against that consciousness somehow arises out of matter. Perhaps it is an emergent property of matter, lying dormant, such as inside a rock. But if organized in just the right way it comes alive. But that would seem par for the course if I were to just accept the universe as-is and not question the origin of anything. There's living beings walking around, doing things. Big deal. But when I begin to stop observing and start introspecting about my own awareness and my own state of being conscious, that is when the big mysteries surface. The origin of myself (and everyone else) must be directly related to the origin of the universe. 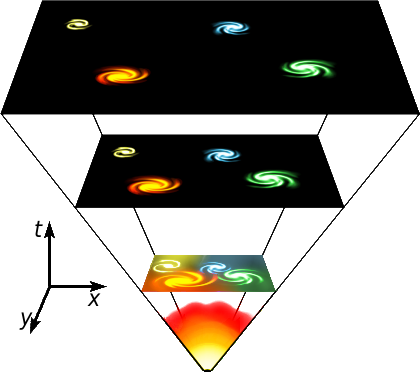 This is true because everything came out of the same point of origin (the big bang). So like it or not, everything is connected in some way. What happens to consciousness after death? Does our consciousness go back to a state of dormancy as the cells in our body break down and are re-absorbed into the earth? Or does our consciousness continue to exist in another realm. Perhaps it's the same realm that gives rise to consciousness in the first place and whose bridge to this universe is through our brains. Does this seem crazy? But is this any crazier than the Big Bang theory in which time and space expanded into what we have now? Remember, this is supported by science. Consciousness is perhaps the ultimate mystery, given that it feels so real and yet is so elusive in its understanding. You can't see it. You can't touch it. You can't smell it. You can't hear it. You can't taste it. And you can't measure it. It's the only thing in the universe that we know of that is not determined or measured scientifically but which we undeniably know is real. Sure, we can measure brainwave signals which correlate with consciousness, but correlation is not causality necessarily. It is said that NDE's (near death experiences) may occur when the brain comes back "online" after the heart starts beating again. And it is said that this happens rather than the alternative explanation in which the NDE occurs when the brain is electrically inactive, or "dead" in other words. There is much debate over which theory is correct and perhaps it will never be resolved for the simple reason that the person must regain consciousness in order to recount an NDE to us. For this to happen the brain must always come back online thereby erasing the proof of an NDE occurring when the brain is offline. As part of the AWARE study Parnia and colleagues have investigated out of body claims by using hidden targets placed on shelves that could only be seen from above. Parnia has written "if no one sees the pictures, it shows these experiences are illusions or false memories". Parnia issued a statement indicating that the first phase of the project has been completed and the results are undergoing peer review for publication in a medical journal. No subjects saw the images mounted out of sight according to Parnia's early report of the results of the study at an American Heart Association meeting in November 2013. Οnly two out of the 152 patients reported any visual experiences, and one of them described events that could be verified. The last sentence sounds promising, as well as fascinating. There is also Roger Penrose, a mathematical physicist, who has written books on the connection between fundamental physics and human (or animal) consciousness. He argues that the mind cannot be algorithmic in nature and instead transcends algorithms by its very nature. He says that the physics of consciousness is likely based on quantum mechanics and some "new physics". Maybe consciousness is like energy in which it cannot be destroyed. It can only go dormant or increase in awareness in relation to the complexity of the brain. And consciousness may in fact be a fundamental property of the universe. Just like time and space are fundamental properties of the universe. And as mentioned, it all came out of nothing (the big bang). But this initial "nothingness" condition is quite peculiar in that it gave birth to our universe, and who knows what else. If you can create something out of nothing then it seems that anything (or almost anything) should be possible since you are starting from a blank slate. And however absurd something may seem, it may just exist, if not in this universe then another one. And there may be more than one, according to physicists. Consciousness comes out of life and it grows as life evolves, reaching our level and likely beyond. Life, and consciousness, seems to follow a kind of reverse entropy. It is known that the entropy of the universe must naturally increase. Entropy is related to the level of chaos in a physical system, and an increase in entropy results in an increase in chaos (or disorder) in the system. Physical systems, over time, must always increase in entropy. This is a natural consequence of the laws of nature. But the evolution of life (and consciousness) follows a kind of reverse entropy. As living organisms evolve over time they produce more organized (and less chaotic) systems. Life on earth evolved from self-replicating molecules into what we see today, which is a set of highly organized biological life forms of great variety. And all this from simple and very basic self-replicating molecules which started out over 4 billion years ago. The evolution of life clearly follows the path of increasing complexity. And it does this from the very beginning through some driving mechanism occurring inside a set of "special" molecules whose only action is self-replication. Therefore, it may very well be that the most fundamental conscious act is that of self-replication on the molecular level. And under the right physical conditions consciousness (and life) will arise, and evolve, from that. The most concrete scientific thing I can say about consciousness is that it arises out of living things and it evolves according to some law of reverse entropy. But other than that it appears to be totally beyond what we can comprehend, partly because there is only so much we can see from our vantage point in the universe, and partly because our brains are not sophisticated enough. The problem is quite simply beyond our intellectual and exploratory reach, and it is only through science that we stand any chance at all of getting closer to understanding it. For the time being consciousness must be considered to be totally elusive or totally fundamental. But at the same time it is a completely necessary thing since the only way we can explore and make sense of the universe, and ourselves, is through conscious awareness.